PROPERTY developers seized control of seven more council homes on Monday as the Town Hall stepped up its public housing sell-off. Camden Council netted more than £7.5 million during an auction at the exclusive Café Royal in Piccadilly. The homes had been estimated by Camden at being worth half that figure leading to suggestions that the housing department does not realise the true value of its portfolio. The sale marked the second batch of council homes to go under the hammer within five months and the Liberal Democrat and Conservative coalition are determined to sell hundreds more to raise funds. Lib Dem housing chief Councillor Chris Naylor insisted that only the street properties in need of serious investment were being sold. But housing campaigners have warned that the sell-off cannot be reversed and Camden is losing homes that could be converted for use by those stuck on the mammoth waiting list for council properties. They argue that private bidders are likely to make a tidy profit. Rival builders and developers fought tooth-and-nail over the latest homes to be judged surplus to requirements by the coalition. One of the properties – a double-fronted de­tached house in Hilltop Road, West Hampstead – was expected to fetch £1.5 million but there were gasps when it sold for double the estimated price. 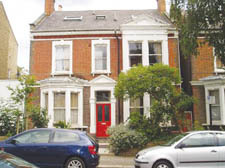 Among the other sales, Camden also cashed-in on a four-floor semi in Parkhill Road, Belsize Park. The winning buyer, who would not be named, said he was “very, very happy” after splashing out £1.74 million on the freehold. Each of the seven properties were sold not to private home-buyers but mystery developers happy to stump-up initial costs, including an immediate 10 per cent fee – with the likelihood of large profits on the horizon. Privately, some builders in the auction, run by Camden Town firm McHugh & co, said the final prices were unusually low given the amount of works needed to get them back on the market. Mike Cookson-Taylor, from Camden Association of Street Properties (Casp), said: “If the council maintained its properties properly they would not fall into this kind of disrepair. “They neglect the property, it deteriorates then claim they have to sell it off. Cllr Naylor said the council was starved of investment from government and needed to sell the homes to raise money to repair the rest of Camden’s properties. He said: “With 11,000 of our homes needing urgent investment, we have to get on with our plans to get our homes up to the standard our tenants need and deserve. Cllr Naylor is due to meet with Casp members at a public meeting at the Town Hall on Monday night. He will answer questions in the main chamber from 7pm.